Hot Chicken is a 'thing' in Nashville. According to Wikipedia, hot chicken is "is a type of fried chicken that is a local specialty of Nashville,... In its typical preparation, it is a portion of breast, thigh, or wing that has been marinated in buttermilk, breaded, sauced using a paste that has been heavily spiced with cayenne pepper, and pan-fried. It is served atop slices of white bread with pickle chips." There's even a Hot Chicken Festival every 4th of July. (I know Lauren at Lladybird is a fan!) There are supposedly 14+ restaurants in Nashville now that serve some variation. My coworkers are hot chicken fanatics. But since spicy food sends me running for Tums, I haven't attempted to try it since I moved here. Still, I was kind of excited when my team decided to have lunch at Hattie B's recently! My Hattie B's experience made me feel like a real foodie... I had to endure 90-degree weather, an outdoor line, and dining without air conditioner to get this meal. I was physically MELTING! The line was literally out the door and down into the parking lot. Talk about antici- wait for it -pation. Even on a weekday at lunch! I hear on Sundays the line goes for hours since they serve the chicken on waffles. Look, I'm not going to pretend I ordered something super hot. Medium-heat salsa is as adventurous as I get without chugging a gallon of milk. Call me sensitive. So I ordered *mild* tenders, pimento mac 'n' cheese, and fries, topped off with an ice-cold lemonade. YUM. The lemonade was awesome, by the way. It was good like a lemon shake-up or Chik-fil-a. Thirst quenched. As for the food, it was DELICIOUS. I could still sense a bit of heat on the mild chicken, enough that I could really take in the flavor. The macaroni had kick to it too. Everything I had was so good. And yes, the chicken was served on a slice of bread with pickle chips! I'm supposed to check out Prince's in October with my coworkers, which is one of (if not THE) original hot chicken joint that started the trend. Since I survived "mild" at Hattie B's, maybe I'll step it up to "medium" at Prince's? But then again, the heat is all relative... and apparently delicious. 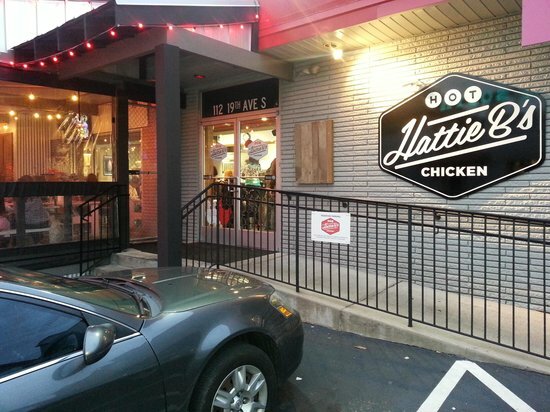 Hattie B's is my favorite out of all the hot chicken establishments I've tried! Their chicken is the juiciest and the spicy crust is spectacular. Not to mention the sides rule (collared green? Yes please!). Ughh let's have a blogger meet-up there, I love them so much haha. I never did eat at Hattie B's, but I did eat at Princes...and loved it! Just a heads up ( at least when I went) it was cash only and there were only like five tables in the joint. Also, it took F-O-R-E-V-E-R to get my chicken b/c they fry it up once you order it, and it wasn't the cleanest place I ever ate. But gosh darn it, it was good. At the time you could call ahead to order. I always said after that it would be great to pickup and take to a park for a picnic. Yeah, we scheduled to go during lunch because it's kind of a hike... but I figure I gotta try it once!